We might be having a baby boom around here, but that doesn’t mean there haven’t been fertility struggles getting to this point. Jenn went on her own journey and there have been miscarriages among us. While we know that sometimes medical intervention in getting pregnant is a necessity, we aren’t opposed to doing everything we can to fuel our body for fertility and beyond — especially when that fuel is this delicious smoothie! 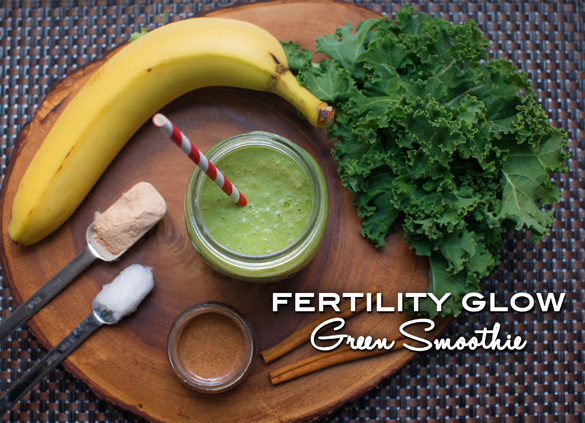 Today, Kim Sjoblad, a certified nutritional practitioner and holistic fertility expert, joins us with a smoothie recipe for a green fertility glow smoothie. She’s the creator of The Fertility Glow and The Pregnancy Glow programs, which educate and coach women on the many holistic ways to improve overall health and provide options for preconception. Every woman struggling with her fertility needs to eat foods that are as close to nature as possible — whole food, real food. With busy lifestyles, it can be difficult to get all the servings of whole foods that you need. That’s why the first thing I always recommend to help increase fertility is to drink a fertility smoothie every day. A smoothie is my idea of “fast” food, but with whole foods. It is an easy, fast and delicious way to power up your diet. You can pack a lot of nutrition into a smoothie and just blend and go. With a smoothie, you may be able to pack in more fruits, veggies and healthy fats than you would normally get from meals alone. So, what makes this smoothie a “fertility” smoothie? Quality foods nourish your body and provide the building blocks for ovulation. An added bonus of eating whole foods is you get a big dose of fiber, too. Fiber is a foundational nutrient that helps regulate blood sugar. Getting your blood sugar under control is crucial when it comes to addressing fertility issues such as polycystic ovarian syndrome (PCOS) and hormonal imbalances. When making your smoothie, try to use the absolute best ingredients. You will never find dairy products in my fertility smoothies because of the mucous and acidifying effect it has on the body. You also won’t find any soy products because of the negative effect they have on hormones. Boost your natural fertility with this smoothie recipe. Tip: Adding peeled bananas from the freezer will make your smoothie creamy and you won’t need ice. This sounds like a good one for grandmas, too!